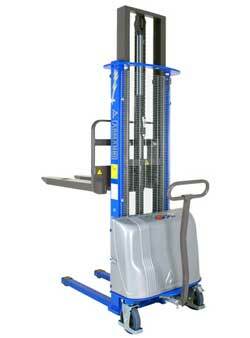 The Beta 12v Semi Electric Stacker has the perfect combination between a fully electric stacker and a manual stacker. Due to its manual push and pull and its electric raise and lower. The robust structure together with the electric lifting system ensure capacities of up to 1500kg even at considerable heights; this type of machine represents a real alternative to electronic models, guaranteeing a low degree of fatigue for the operator. Shockproof casing made of sheet steel and ABS for containing all the primary components, control unit, battery, battery charger, etc. The current regulations in terms of safety at the workplace impose very strict limits on the manual movement of loads by the operator; therefore, the BETA 12v semi electric stacker represents the right and economical solution in order to move medium-heavy loads in compliance with the current regulations.